If you own a pool, you will surely agree with me when I say that regular cleaning can be a challenging task. Automatic pool cleaners are to the rescue. Available in three types – robotic, pressure, and suction – they are effective in getting rid of debris in the pool water. With the right choice for an automatic pool cleaner, you will have clean and refreshing water to dive into. Plus, cleaning will be a breeze, requiring minimal time and effort on your end. If you are clueless about which one can prove to be the best choice, read on and learn from some of our recommendations. What is the Difference between Suction, Pressure, and Robotic Pool Cleaners? What is the Difference Between Above Ground and In-Ground Pool Cleaner? How Do You Clean and Maintain Automatic Pool Cleaners? Do Pool Cleaners Climb on Walls? Can You Use Pool Cleaners on Vinyl? Are Automatic Pool Cleaners Replacement to Manual Brushing and Scrubbing? What Should You Do if Dirt Gets Stuck in the Pool Cleaner? Our team spent hours of research to evaluate the top-notch automatic pool cleaners on the market, including those that are briefly mentioned below. Although quite expensive, this is a notable pool cleaner with a two-wheel drive system that allows it to move around without difficulty. However, if you need one that can climb efficiently on the pool, this might not be the best choice. The pool cleaner comes with a patented adjustable roller skirt, which will help in delivering optimal suction even if the pool floor is uneven. It also comes with multiple pre-programmed steering settings, which will allow it to be smart enough to maneuver and make sure that no part of the pool is left uncleaned. With the powerful suction and the innovative scanning technology that is delivered by this product, you can be confident that the cleaning performance will be hard to match. Feature-wise, it is a good thing that it has it has patented swivel technology, which will prevent the cords from being tangled as it cleans. It also has a single-button operation, making it a snap to use. Plus, it has a remote and a weekly timer, allowing you to schedule the cleaning in advance. This is a powerful suction cleaner that delivers whisper-quiet performance. It is recommended that you use it with a low-speed pump to achieve optimal cleaning performance. There is a Flow Keeper Valve, which automatically adjusts the flow of water depending on the pump that you are using. The cleaner comes with a disc that has 36 fins for maximum cleaning coverage. The fins will adhere to a variety of materials. However, while it can clean even large debris, it will be directed to the filter basket of your pool, which can result in clogging. The durability of this product is one of its strongest points, which can be attributed to the fact that there is only one moving part. It has no wheels or gears that will require a replacement throughout its functional life. All that you have to do is to hook this on the skimmer line. It uses the existing pump and filter of the pool as it cleans. It also has hydraulic design and true random pattern coverage, both of which will make sure that no traces of dirt will remain on the pool once it is done cleaning. Small but terrible – this is one of the best ways to describe this robotic pool cleaner. It is compact but this does not mean that its performance is compromised. One of the notable features of this product is the Hyper-Brush Active Scrubbing. Simply put, this is the one that allows this to scrub powerfully to get rid of the contaminants that are possibly present in your pool. A lot of its users were also happy with the improved traction on different surfaces. This is one of the most advanced robotic pool cleaners you can find on the market today. It features Bluetooth Navigation System, so you can use a virtual joystick to be able to control the movements of the cleaner. It also has Power Stream Jets, providing a powerful stream of water that tackles even tough dirt on the surface. It also provides improved friction. However, there were some complaints from its users with regards to how it does not thoroughly clean all sections of the pool, including the stairs and shallow portions. Designed for both above ground and in-ground pools, it comes with non-marring wheels, so this will not damage the surface material. It has a self-contained mobile filtration, which eliminates the need to have it connected to your pool system. Meanwhile, there is a jet-propelled system to ensure the effectiveness in tackling dirt on the pool without exerting too much effort. A lot of its users were happy over the fact that it is a low-maintenance product. There are no parts that will require immediate replacement. It is built to withstand the test of time. The turbine-drive system is one feature that gives this a distinct advantage over many of its competitors. Basically, it allows the cleaner to operate smoothly and quietly. It is powered by the existing filtration of your pool, so there is no need to have an external booster pump. It is designed with enhanced wings and skirts, which will improve the efficiency of the vacuum as it cleans more in a short time. The unique design of this pool cleaner is perhaps the first thing that will capture your attention. More than the design, it is packed with features that make it powerful, such as the turbine system for the right balance of water while making sure of its quiet performance. It has a Smart Drive Program Steering, which has been exclusively developed by Hayward to make sure that no spot will be missed as it cleans. Nonetheless, with the plastic that is used in the construction of this product, it seems like the durability is not its best asset. One of the best features of this product is the Quick Clean Technology, a patented innovation that allows it to clean more in a short time. This can result in up to 94% energy costs since it requires less to do more. The robotic cleaner comes with an intelligent on-board computer that dictates exactly where it should go, making sure that even the corners will be dealt with. However, one of the issues that you can encounter in this product is with regards to the longevity of the motor, which some people find to be not as long-lasting as others. Intex is one of the leading manufacturers of above ground pools. They developed this cleaner as the perfect companion for their pools. To maximize the cleaning performance of this cleaner, however, make sure that it is connected to a filter pump with a flow rate that ranges from 1,600 to 3,500 gallons per hour. It should also have a 1-1/2-inch fitting for the hose. Featuring advanced cleaning technology and triple jets, this is another product that is guaranteed to deliver pool cleaning performance that is hard to match. The versatility of this product is one of the reasons why it is notable. It can sweep, scrub, and vacuum pools. This cleaner is connected directly to the circulation pump of the pool. There is a 31-foot hose, which means that the maneuverability will not be limited. Regardless of the size of your in-ground pool, this can prove to be a reliable cleaning companion. It is equipped with a four-wheel drive system and has Aqua-Trax tires that are developed to deliver optimal cleaning performance regardless of the surface material of your in-ground pool. With the rear water propulsion system, it efficiently cleans even tight corners and under the stairs. There is also ActivMotion Sensor Technology to provide smart navigation. Meaning, it will clean all areas of the pool. To deliver maximum power, it has the innovative Vortex Vacuum Technology, which has been developed exclusively to allow the cleaner to pick up even large debris. This is a robotic cleaner that will work for above ground pools and small in-ground pools. Regardless of the surface material, whether it is vinyl, fiberglass, or concrete, among others, you can expect it to work well. It also comes with an extra-large filter bag with a generous capacity, so there is no need to empty it every now and then. Looking at the reviews from its users, however, there are many of them who are saying that this product does not fare well in terms of durability, so be sure to keep it well-maintained. If you have an in-ground pool, this can be an excellent cleaning companion. It has a variable speed pump and a cyclonic suction to provide an assurance that it will leave your pool spotless. The articulating turbine blade is also a good feature, which will allow it to climb walls. However, there are some users who feel that the cleaner can be quite flimsy. This can be attributed to the fact that there are lots of plastic parts that can be easily prone to wear. This is a more powerful iteration of the product that has been mentioned above. It is also made for all types of in-ground pools. It has the innovative Cyclonic Vacuum Technology, which will ensure optimal cleaning performance even for large debris. To add, it also has X-Drive Technology for revolutionary navigation, making sure that all parts of the pool will be cleaned thoroughly. Meanwhile, with the X-trax tires, it will glide smoothly on all surfaces. Plus, it also has the ability to climb the walls and clean even tight spaces. One of the best features of this product is the SmartTrac Programmed Steering, which will allow effortless navigation when cleaning in-ground pools. It has a 15-inch cleaning path to clean more within a short span of time. It is also a great option if you are looking for a user-friendly pool cleaner. Right out of the box, it is almost ready to be used and comes complete with the accessories that will be needed. Lastly, there is an agile turning mechanism, providing an assurance that no part will be missed. The main difference of this product from those that have been mentioned above is the source of power. It has panels that will allow it to harness energy from the heat of the sun, making this an eco-friendly alternative. This model comes with an on-board tray that can hold up to two chlorine tablets, making it easier to maintain the cleanliness of water in the pool. However, the cleaning performance may not be as tough. It is best to limit its use in small pools that do not need extensive cleaning. Otherwise, you might end up in frustration. Before we end this post, we’ll try to answer some of the most common questions a lot of people may have about automatic pool cleaners. Suction Pool Cleaner: This will be attached to the suction system of your pool, such as the skimmer. They are the cheapest from the three types, although, this can be quite frustrating as it can easily clog. Pressure Pool Cleaner: It makes use of water pressure from a pool or booster pump. They are powerful and great in terms of speed. Even for large debris, it can be effective. 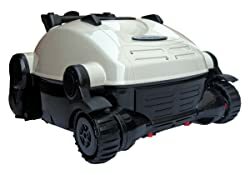 Robotic Pool Cleaner: One of the best things about this cleaner is that there is no need to hook it with a filtration system as it works independently. They have an onboard motor and equipped with their own debris bag. When choosing a pool cleaner, one of the best starting points is to determine the type of pool that you will clean know which one will work best. While there are some with a hybrid design, most will be made to be used only on a specific type of pool. Usually, above-ground pools are deeper and larger, which is why you will need a more powerful automatic pool cleaner. It must be able to collect more dirt and should have a wide cleaning path. Different manufacturers will have different requirements when it comes to the care and maintenance of their pool cleaners. It is important to follow their instructions religiously. It is important that you rinse the pool cleaner after every use, paying attention to the little corners to be sure that no dirt will be lodged. All working components should be washed. It should be stored in a dry place after use. You should never leave the cleaner in the pool when it is not used. Keep it in a place where it will be away from dust and dirt. Yes, but this depends on the model that you will choose. Some pool cleaners are powerful enough to climb on the side of the pool, providing an assurance that no area will be left uncleaned. They can even climb stairs and clean tight corners. Especially if you have an above-ground pool, vinyl is one of the most popular materials. It is important to check with the manufacturer if the cleaner is rated for vinyl use. In most instance, vinyl is brittle and can be deformed when you use the wrong kind of automatic pool cleaner. Yes, as long as you choose a top-notch product! Gone were the days when you need to manually clean the pool and spend a lot of time doing it. These are intelligent tools that will clean the pool as if they have a mind of their own, making sure that they cover all the necessary areas. If you are using a powerful and reliable automatic pool cleaner, chances are, you won’t be confronted with this situation. However, if there is dirt, such as large leaves that are stuck, the best thing to do is to remove them manually, but make sure to turn off the pool cleaner first. You can also use water with high pressure to dislodge the debris that has been stuck. Keep the pool water free of algae, dirt, and other types of dirt! Use the automatic pool cleaners that have been mentioned above to make it pristine and spotless. With these products, you do not have to exert a lot of effort and waste time in keeping the pool well-maintained.